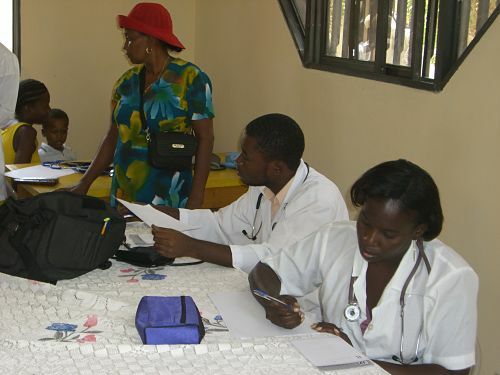 The Committee for the Advancement of Gressier-Haiti (CAGH) was founded by the Gressier Diaspora with the aim of improving the quality of life for the people of Gressier through education and health care programs. We have been working with this community for more than 20 years, contributing to their development. In 1995, a meeting of CAGH-France and CAGH-USA was held in order to set up a common action plan for the development of Gressier. There was a meeting of Congress in Gressier in 1997, which led to the sponsorship of school-aged children to increase the enrollment in the community, as well as the organization of the first medical fair. We worked to build temporary shelters for the people of Gressier before the rainy season, and planned to send envoys to bring tents and other necessary tools to help with the relief effort. Read about what we hope to accomplish. Education, workforce development, medical care, and partnerships. What you can do to contribute. No matter the size of the contribution, everything helps! Who we can thank for their support. 1999 and 2000, addressing instructors in Gressier under the direction of Professor Yvon Lamour from Boston, Massachusetts, USA. 2001 saw the construction of a center for socio-educational development. A two day medical fair and roundtable discussion was held within the framework of a partnership with other regional association in 2008 for the reorganization of COLIDEG to facilitate the local initiative. Providing financial assistance and expertise in various areas. Gressier is a small town, 13 miles west of the capital city, and was severely hit by the earthquake in 2010, but was not covered in any aspect by the media. Assistance went to larger cities, but Gressier was skipped, which is located between Port-Au-Prince, Leogane and Jacmel. CAGH was the only organization that had people at ground zero and knew what the immediate needs of the people were in this catastrophic situation. There were thousands of people in Gressier who died beneath the rubble left behind. We were the only ones to send a member who arrived on January 28th with medicine to help in the relief efforts, as well as a doctor who put together a mobile clinic to provide care for the injured. CAGH has its own center in Gressier devoted to the service of the community, the Socio-Educational Development Center. It was built in 2001 through the financial contributions of its Diaspora members and the kindness of the local members. We have provided assistance to the people of Gressier without any donations from other international organizations or NGOs based in Haiti. There are so many families who are without basic needs, such as food, clothing, shelter, running water, medicine and urgent medical care. 15 years have been spent negotiating and gathering funds to build a school. Now that it has been destroyed, it is even more important that we help the children return to school, which will occupy their thoughts away from this tragedy. Services have been provided to the community to help cope with post-traumatic stress through our volunteer therapists. Facing this catastrophic event and confronting the immense challenges that followed, CAGH turned its attention toward outside help for the first time. After community development activities in 2009, our financial resources are now limited. We cannot tackle these new problems without your help. We want to save Haiti from diseases and epidemics of all kinds. We need your help to restore life to the people of Gressier. God bless you, and thank you for your support. The leaders of each area were contacted for organization of food and water distributions. Envoys were on the ground to supervise food and water distribution as well as setting up a temporary canteen to serve lunch to the people. We waited for a list of medicines needed and recommended by our team of doctors on call. There were alternate day clinics for each camp. CAGH sent local medical personnel who were volunteers to serve those camps. We looked for additional help from international volunteer health workers. As with our other health related activities, medicines were distributed to those in need of services. A temporary orphanage was needed for shelter, therefore CAGH set up a special camp. There was therapy sessions offered to orphans, as well as children and adults affected. CAGH contacted volunteer therapists to provide post-traumatic stress disorder treatment to the community of Gressier. CAGH rented trucks to transport food and people, as well as providing transportation for the medical team to remote locations. CAGH set up camps to have classes for the students of the National School, which was also used as a shelter. There were miscellaneous items collected, which included medicine, food, water, tents, masks, blankets, water purification devices, clothing and shoes. We thank our generous benefactors for assisting in our fundraising efforts. A committee of nine members has been created to oversee the earthquake relief operation, seven from CAGH and two from the donors group. As outlined in our action plan, CAGH started to act quickly to help the injured people in Gressier, which was severely hit by the earthquake. 95% of the houses in Gressier were destroyed by the quake, and more than 2,000 people died from this catastrophic event. An envoy was sent to Haiti to bring some medical supplies to our medical team in Gressier. Our collaborators arrived in Haiti on January 25, 2010, through the Dominican Republic. On January 28 and 29, our collaborators and the medical team set up clinics in tents and under the trees in different regions of Gressier to treat severely injured people. CAGH sent money to the medical team to buy antibiotics and other medicines to treat the injured, and to prevent the spread of infectious diseases. Our medical team held clinics in Gressier twice a week to provide urgent care and triages to the patients.